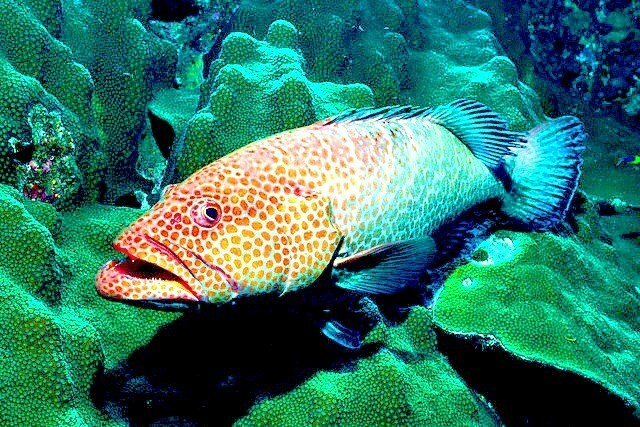 An important commercial species in the western Atlantic, the red hind is a reef-dwelling, robust-bodied, predatory fish. Highly variable in colour, the body of the red hind ranges from cream to greenish-white or pale reddish-brown. The upperparts are typically a light brown, fading to white on the underparts, with five diagonal bars on the sides of the body and a scattering of dull, orange-brown spots on the head, body and fins. The dorsal fin is olive, with a yellow tip on each of the eleven spines, and the tail fin has a broad blackish band with a pale edge. The pectoral fins are pale orange-red, with darker red spots at the base. The body of the red hind is around a third deep as it is long, and large, conspicuous eyes sit behind a gaping jaw armed with two or three rows of strong, slender teeth.